Add this to the “difficult situation” file and try coming to a conclusion on how you feel about this one after hearing the whole story. 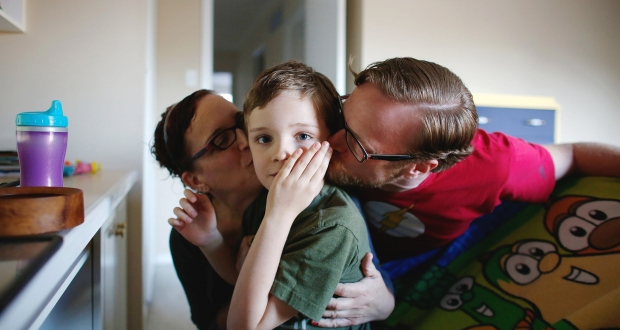 The Ottawa Citizen reported parents Keri Oastler and John From were recently served an N5 notice by their landlord over the noise their autistic son has been making. The couple literally just moved in to the unit on a year long lease that started on October 1st. According to the article, the formal notice came after tenants below and beside the family complained the noise was “like a 50-pound box being dropped repeatedly.” The notice said the two neighbours were disturbed by “running, jumping and screaming” between 6:30 a.m. and 9 a.m. and 4 p.m. and 9:30 p.m. — the only times that From says his son is at home and awake. As is common with N5 notices in the province of Ontario, the family has been afforded 7 days to rectify the problem. From’s son, Logan — an 80-pound, blond, blue-eyed boy — occasionally has tantrums, though they are becoming less and less frequent, his parents say. He will sometimes “squeak” and loves to climb and jump, so much so that his parents say they’re considering acrobatics as a career path. After this whole exchange – From and Oastler no longer want to live in what they’ve described as a hostile environment and are currently considering registering a complaint with the Ontario Human Rights Commission. I can understand where they’re coming from. They just moved in to this place. Kind of difficult to feel unwelcome amidst all this. Residents of the townhouse community on Lisgar stret were set aback a bit on the initial story about this on the 11th. Noise complaints have to be pretty severe in order for most people to complain. A lack of concrete division between units (as is the case here) can do nothing for the dampening of transferable sound, so I can definitely appreciate where the other residents are coming from. As a parent, I can also appreciate where Oastler and From are coming from. It sounds like their son’s condition is a challenge, and situations like these have a tendency to put you on the defensive – but what do you do? The other tenants have the right to the reasonable enjoyment of their units, and the “noise” they’re complaining about sounds like it’s occurring at pretty inopportune times. Imagine sitting down to dinner or trying to get your kids down for the night, and hearing the “constant and repeated dropping of a 50 lb. box”. I think we can all imagine being on both sides of the aisle with this one. According to the Oye Times, who also did a piece on the dilemma, the property management company was not “properly informed” of Logan’s disability by From. From claims he did in fact explain that his son has autism and would be making a little more noise than usual. As an example of the frequent impossibility that many landlords find themselves in – had the landlord denied the application for tenancy based on the explanation of Logan’s disability, From and Oastler could have applied to the Ontario Human Right’s Commission for discrimination on the basis of disability. Now, they’re doing it anyways. This kind of thing can happen. Landlords can get raked over the coals over stuff like this – even if they do the right thing and have good intentions. To add a level of complexity to the situation – the landlord is also bound by the will of the condominium board (they pushed on the notice serving with the owner/property manager) – proving that condo landlords have it a little harder. In the end, it sounds like it just wasn’t a good match between unit and tenant. From and Oastler are better served to be living in a single family home or a more audibly insulated unit from their neighbours. What do you think? Share an opinion here. I’d love to hear the thoughts of other landlords and tenants.